Driving The Scottish Highlands: Mountains, Lochs, and Glens! The Scottish Highlands are just as beautiful as you’ve imagined. 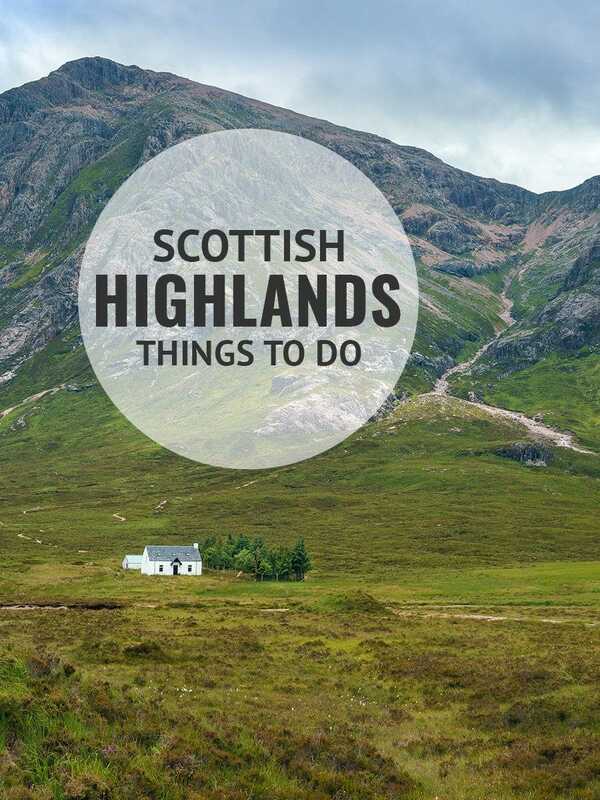 An incredible road trip destination that features rocky peaks and sweeping glens shrouded in mist. The Scottish Highlands have been on my bucket list for years. 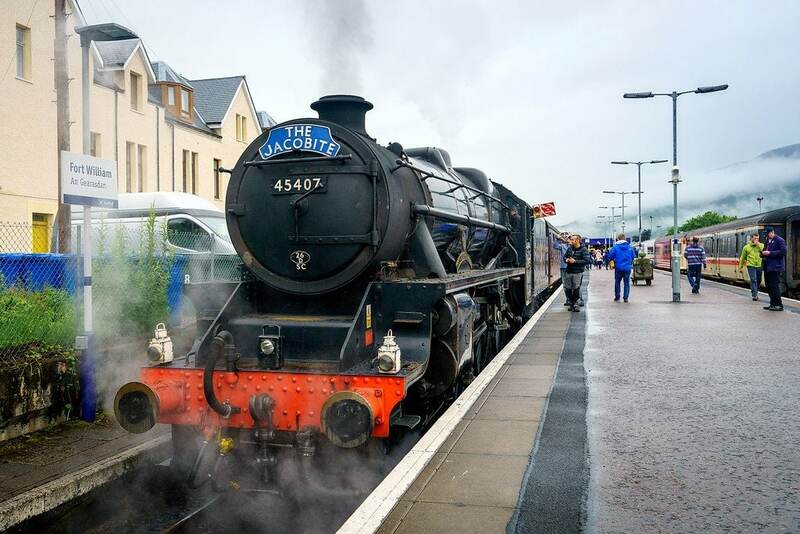 After recently returning from a wonderful 4-day journey through the region of Lochaber and the West Highlands, I wanted to share my favorite highlights and tips to help you plan your own adventure. Why should you visit the Highlands of Scotland? 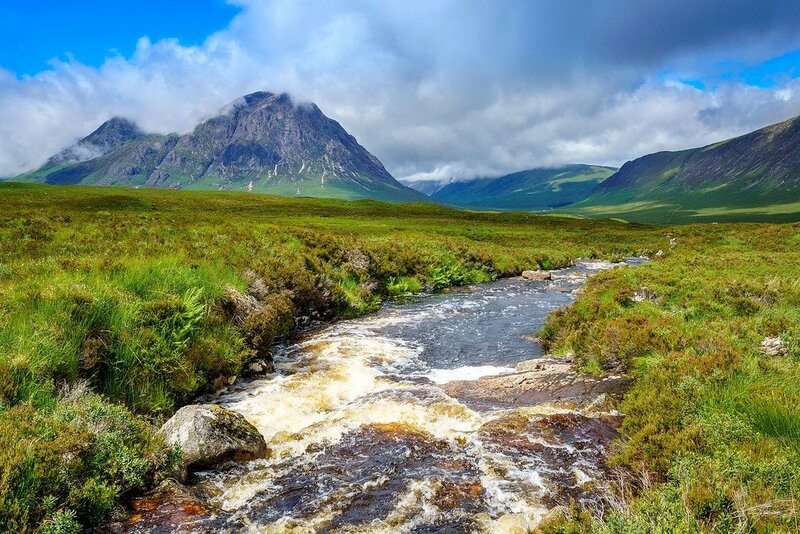 Well, if you’re a fan of hiking majestic mountain ranges, floating mist-covered lochs, or exploring ancient forests, then you’ll love the Highlands. They provide intrepid travelers with fantastic travel photography opportunities and a hearty dose of Scottish charm. The Scottish Highlands are a playground for hikers, bikers, kayakers, and anyone who loves outdoor adventures. 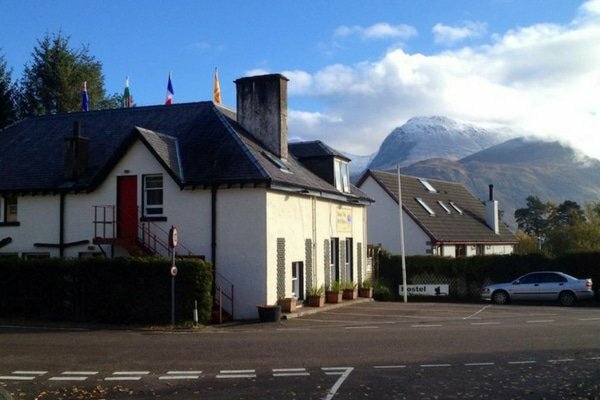 The area of Lochaber around Fort William is considered the outdoor adventure capital of the United Kingdom! 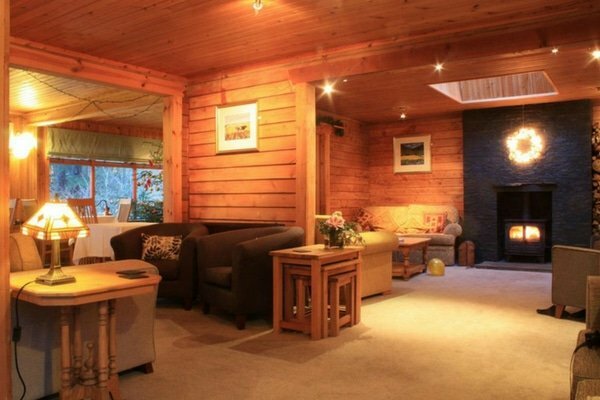 Need A Place To Stay In Scotland? My Scottish Highlands road trip began in Glasgow after taking the train from Edinburgh. Driving up to Fort William from Glasgow along route A82 on my way to the Isle of Skye in early July. The landscape was exceptionally green after weeks of rain. Weather in Scotland is often cold, windy, and rainy — however don’t let that dissuade you, these conditions also produce some very dramatic scenery. There’s tumultuous history here too… dark tales of epic clan battles and murderous plots. Mythical legends of lake monsters, fairies, and goblins. In the Highlands, you never know what hidden treasures you’ll uncover while venturing off into the Scottish countryside. I certainly found plenty! The landscape can be harsh and unforgiving, but totally worth a trip. My first stop on the drive from Glasgow into the Highlands was the town of Balloch on the banks of Loch Lomond. The area is part of Loch Lomond and The Trossachs National Park. It was raining pretty heavily, so we didn’t stick around too long, but I did walk aboard the Maid Of The Loch, a fantastic 60-year-old paddle steamship currently undergoing renovation. 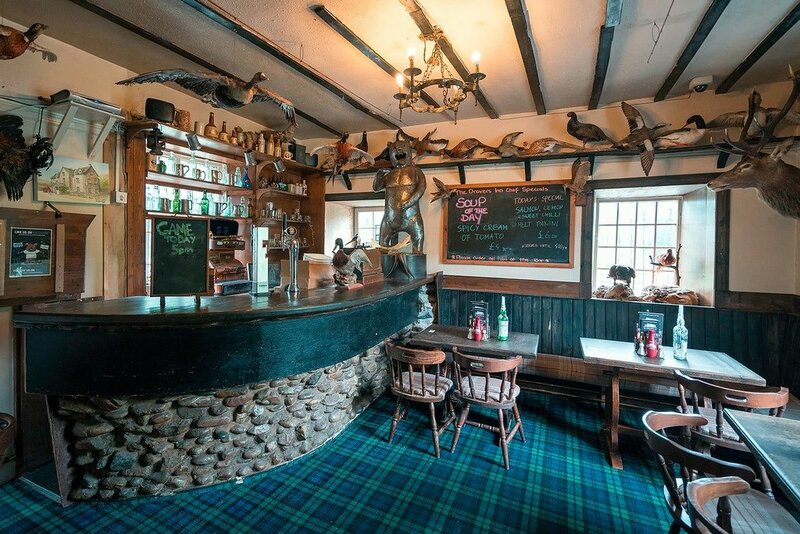 Further up the road, make sure to pop into the 300-year-old (and some say haunted) Drovers Inn for traditional Scottish food or a dram of whisky (unless you’re driving of course). 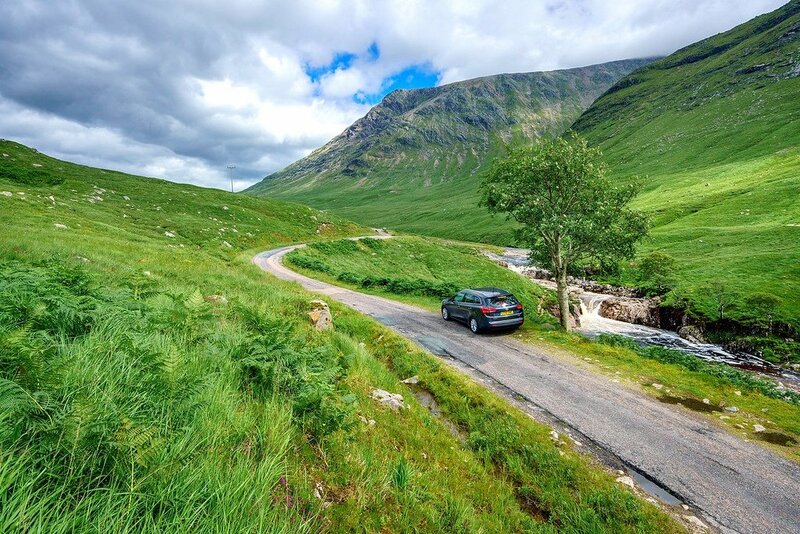 A winding single track lane passing into the narrow valley of Glen Etive will have any driving enthusiast grinning from ear to ear. It’s a wonderful little side trip off the beaten track when driving through the Scottish Highlands. 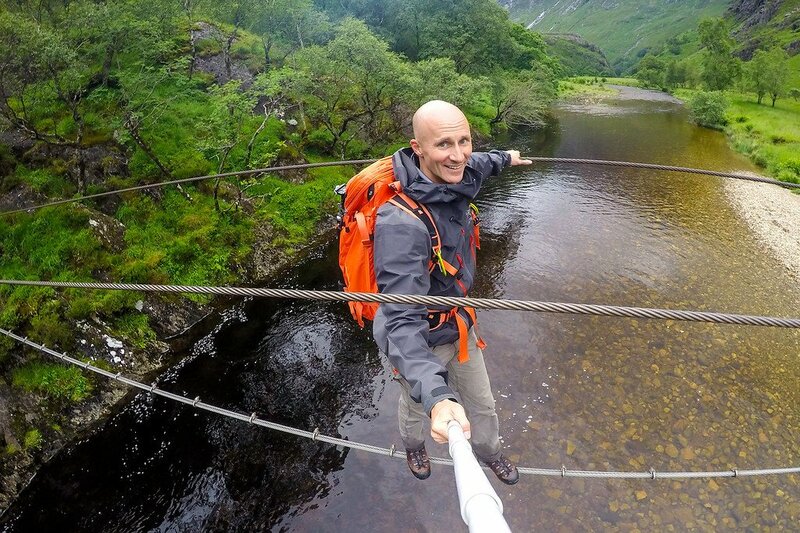 You’ve probably already seen Glen Etive before, but didn’t know it. The landscape was a filming location for the popular James Bond movie “Skyfall”, where James takes his iconic Aston Martin DB5 out for a drive. The icy cold Etive River passes beside the road, and for the more adventurous, it’s a great place to go cliff jumping. Hiking or kayaking (with your own gear) around Loch Etive at the end of the road is another option. 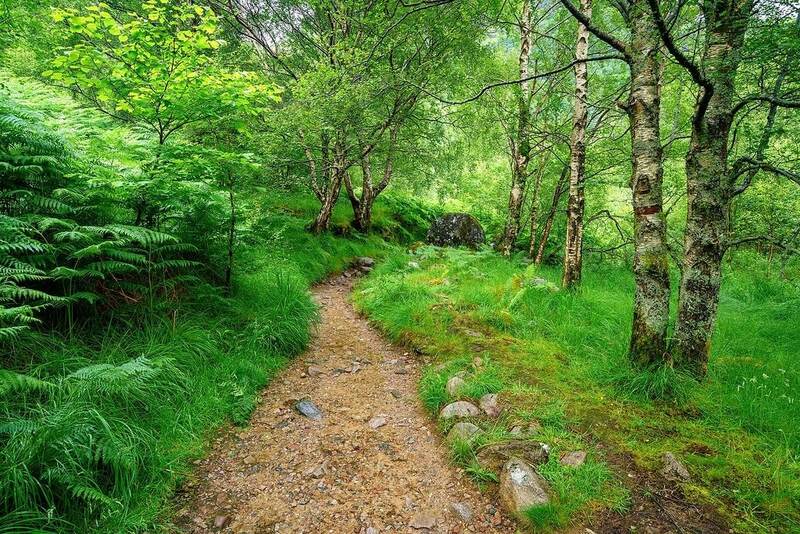 If you’re a hiker, the Scottish Highlands have trails for all levels. Lochaber is home to Ben Nevis, the United Kingdom’s highest mountain at 4,416 feet (1,346 meters). Munro bagging is a popular activity — summiting mountains over 3,000 feet. 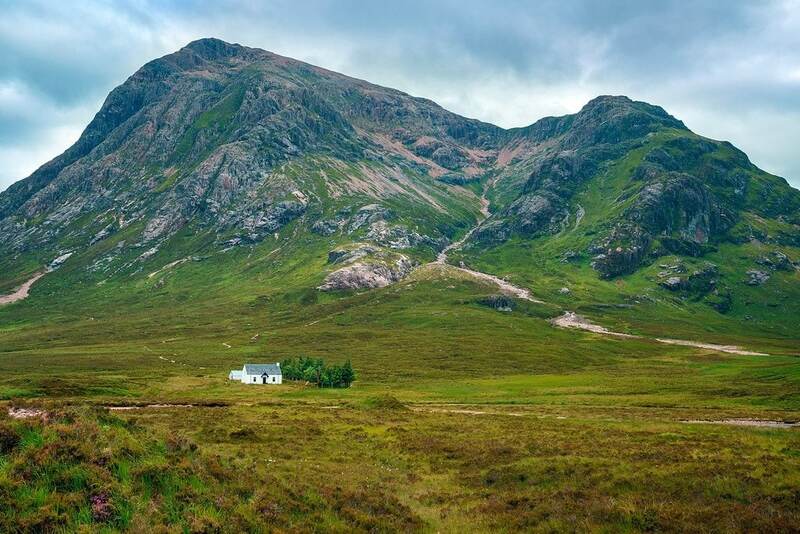 For those who enjoy long-distance treks, the West Highland Way stretches some 96 miles through the best of the Highlands and takes most hikers 5-7 days. You can carry everything with you, or hire a company to transport the bulk of your gear to guesthouses ahead of your arrival. Countless shorter day hikes can be found in the area too. One of my favorites was Steall Falls and Nevis Gorge, where the trail follows a mountain river funneling into a narrow rocky gorge. 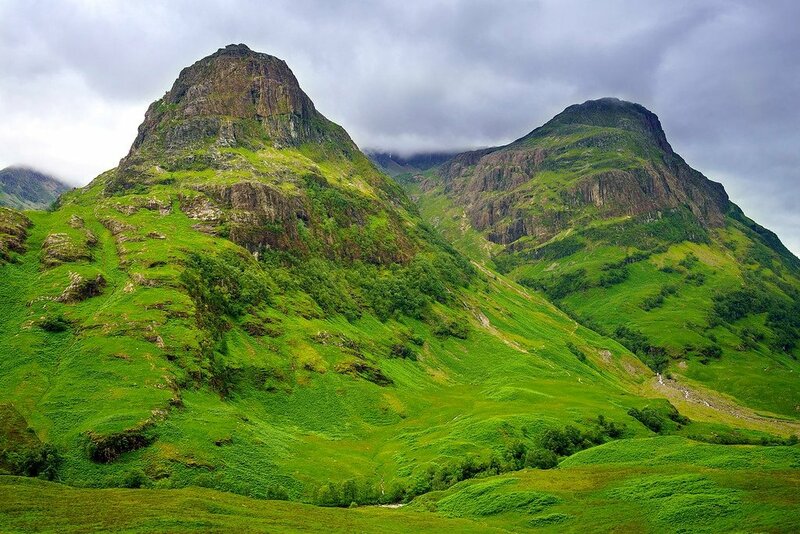 It ends in a huge meadow, with Scotland’s 2nd highest waterfall dropping over 300 feet from the high mountains beyond. 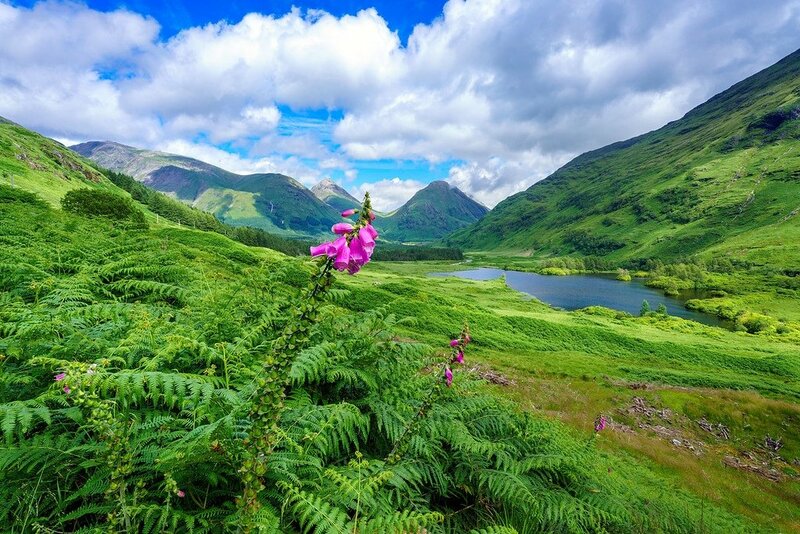 Widely considered one of the most beautiful areas of the United Kingdom, the spectacular valley of Glen Coe has a haunted past as the site of a 17th-century massacre which saw 38 members of the MacDonald Clan hunted to death in the snow. Another 40 women & children died of exposure when their homes were burned to the ground. Yet the landscape is equally as haunting as its past. Driving around the towering peaks of the “Three Sisters” under foreboding clouds & drizzling rain, you can feel the weight of sadness on this place. Pull off on the side of the road for photos, or spend an afternoon hiking a few of the trails. Further on is the village of Glencoe, where you can find lodges, cafes, or restaurants to help break up the drive. Remember the Hogwarts Express from Harry Potter? Well, that train really exists! 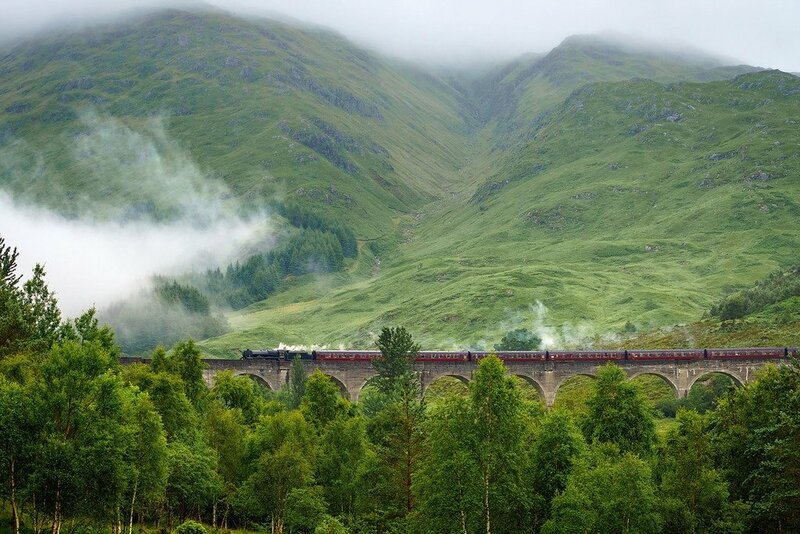 The Jacobite Steam Train has been called the most scenic train journey in the world, and for good reason. Starting in Fort William, this 84 mile journey takes passengers deep into the Highlands, ending at the small fishing village of Mallaig. Along the way it travels across old stone bridges, through misty mountain passes, and past deep freshwater lochs. Tickets sell out fast, but if you’re driving nearby, you should stop at the lookout over Glenfinnan Viaduct, where the train passes around 11am and 3pm for wonderful photo opportunities! Loch Ness is a deep, cold, and very murky lake in the heart of the Scottish Highlands near the town of Inverness. For years locals and tourists have reported witnessing a large unidentified creature with a long neck swimming through the water. 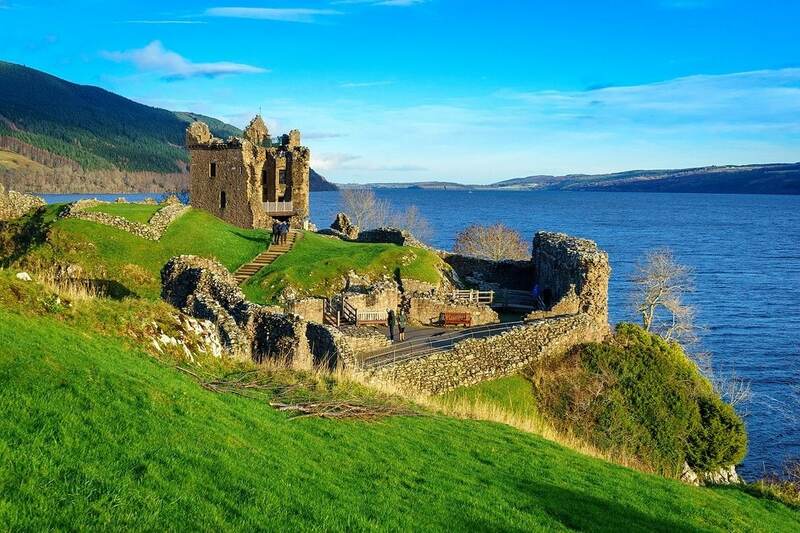 A popular activity is sailing across Loch Ness to the ancient ruins of Urquart Castle, searching for the Loch Ness Monster (aka Nessie) along the way. I hit up Loch Ness while driving back from Skye to catch a train to Glasgow at the end of my journey. Some people believe Nessie is a plesiosaur, a dinosaur who’s survived to modern times by living isolated from the sea within the loch. What do you think? Is the Loch Ness Monster real? 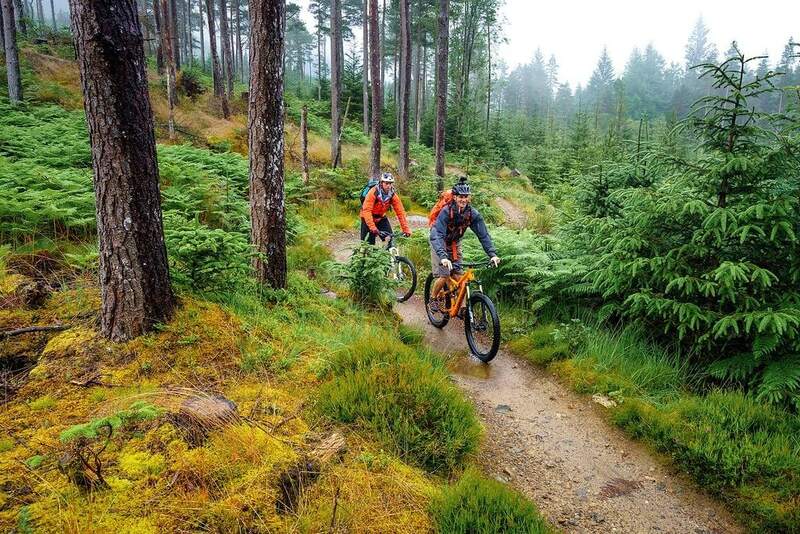 Under the shadow of Ben Nevis, the UK’s highest mountain, lies the Nevis Range mountain bike trails. They have trails for all levels, from relaxing forrest routes to white-knuckle World Cup downhill tracks. You can rent all sorts of different bikes and protective gear from £25 – £60 per day, and either cycle uphill through the cross country trails on your own, or ride the gondola lift up to the world-class downhill trails. I spent the morning riding the “Witches Trails”, a fun mix of single track and wider trails that wind through the trees, with the occasional wooden boardwalk or ramp. A low mist had the forrest looking particularly eerie. Scotland is home to quite a few professional mountain bikers, including Danny Macaskill, the star of an epic short YouTube film called “The Ridge” shot on the Isle of Skye. It will make your heart race! It goes without saying that Scotland is overflowing with its share of magnificent castles. There are literally hundreds of them, both ruined and active residences. Scotland’s castles were built as military fortifications, and there are plenty of epic battle stories or sensational legends to learn about once you visit them. I had the chance to visit a few, like the incredibly picturesque Eilean Donan, the MacLeod family stronghold of Dunvegan in Skye, and the ruins of Urquhart Castle along Loch Ness. 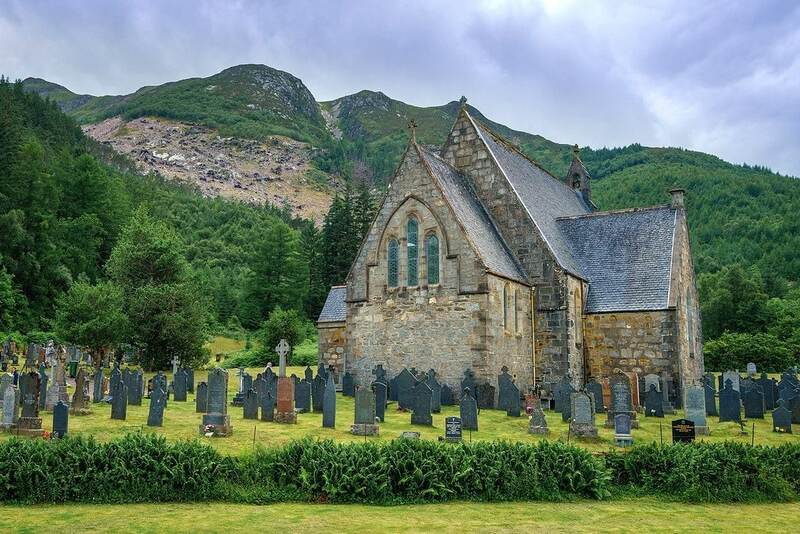 If you’re a fan of old stone churches too, make sure to stop by Glenfinnan Church, St. Andrews, and St. Johns of Ballachulish as you drive through the Highlands. The unofficial capital of the Highlands is the town of Fort William. During the summer high season, hotels and B&B’s can sell out fast so it’s very important to book your accommodation in advance! Quiet hours, large group kitchen, modern interior, great value if you’re on a budget. 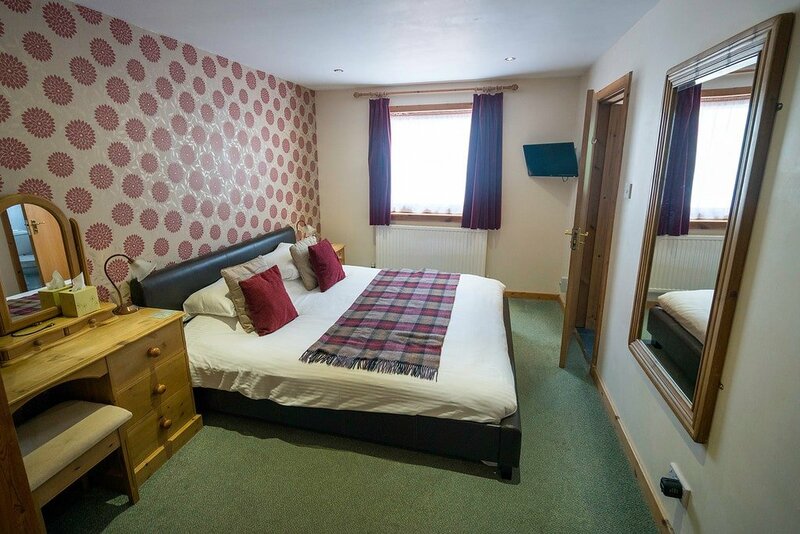 Awesome little B&B located outside of Fort William in the village of Spean Bridge. Wild camping is allowed all over the Scottish Highlands, as long as you follow Scotland’s Outdoor Access Code. Remember to leave no trace! There are a few “bothys” too — wilderness cabins free for hikers to use. Once you visit the Scottish Highlands, the area will remain etched in your memory long after you’ve returned home. 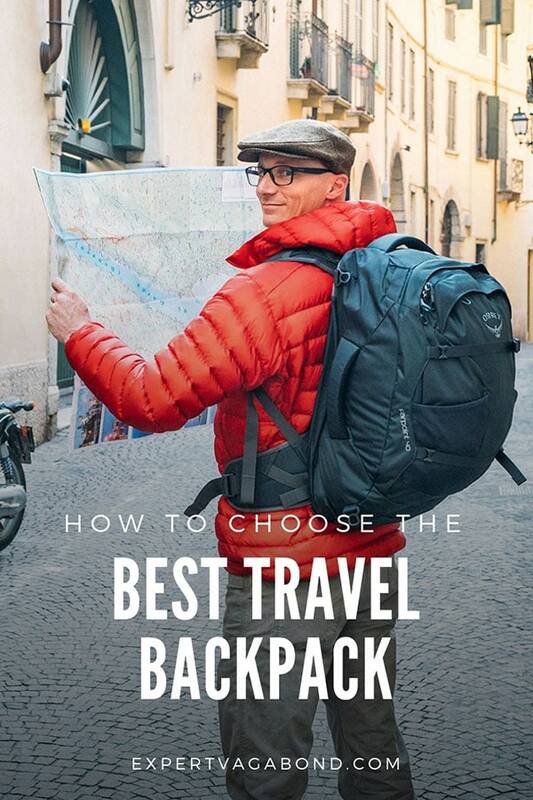 Here are a few tips to consider before you arrive, to ensure you have a great trip. Everyone thinks of Scotland and the UK as expensive places to visit. While that may have been the case a few years ago, right now the exchange rate is excellent if you’re American (thanks Brexit!). Scotland is often wet. April – June are usually the driest and most sunny months of the year. But make sure to pack waterproof gear because weather can, and does, change very quickly year-round. 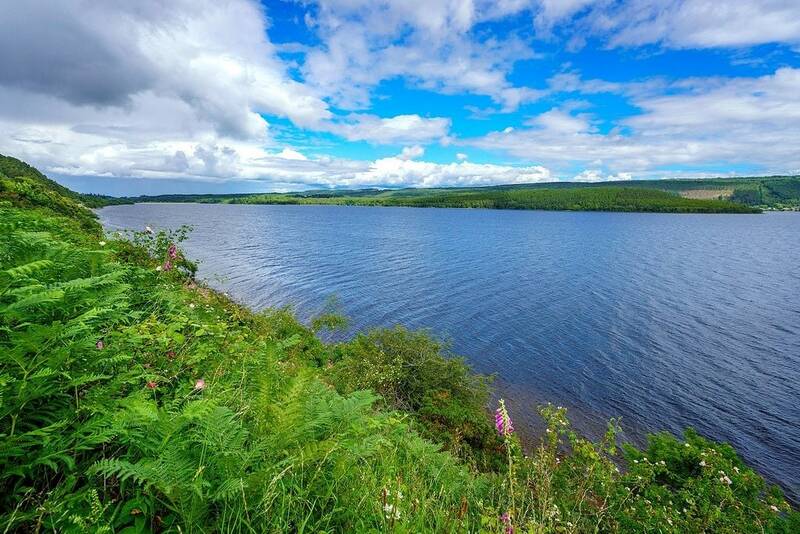 While the drive from Glasgow to Fort William only takes about 2.5 hours, you’ll want to set aside more time to explore the many hidden glens and fun hikes nearby! I’d recommend at least 3 days in the Highlands, if not more. Meeting The Loch Ness Monster! 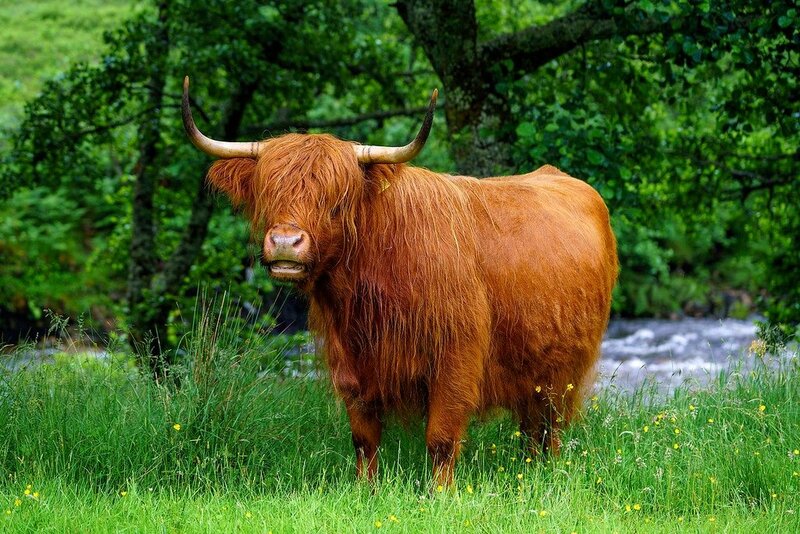 Have any questions about traveling in the Scottish Highlands? What about other suggestions? Drop me a message in the comments below! Gorgeous place to drive around, thanks for sharing the stories. You should definitely visit the Scottish highlands if you have a chance! It’s a beautiful area — and perfect for those who love the outdoors (or are fans of Harry Potter). What an awesome post. I read this because I have just been in Ireland, but I have heard so many good things about Scotland. After seeing these pics, I am ready to take the plane :-) Nice article, keep up the good work. Scotland can be similar to Ireland, the rolling green hills, rainy weather. However the mountains in Scotland are much larger! The Scottish highlands has some excellent hiking if you’re into the outdoors. Love the Highlands! Went to Scotland in 2000, and couldn’t get enough of it. Most of the places you went, I also have been and I am ready to go again anytime. Loved Glen Coe, and really have a picture of “Nessy” either coming or going. It is a wonderful country and so enjoyed your Blog about beautiful Scotland. Thank you. Great to hear Kathy! I only got to scratch the surface of Scotland on my visit, I’d love to return and see other parts of the country beyond the highlands — like the North Coast 500 drive. All the green reminds me of The Hobbit set in New Zealand! It looks gorgeous. I’d have to get used to the food, I admire your bravery in embracing it. I’ll keep Scotland in the back of my mind! Beautiful!! I am going to Scotland in April…now you’ve given me more places to go to and things to cover! Have fun on your trip Siggi! I hope the weather is nice for you. You’ll love the Scottish highlands either way, but it helps to have a bit of sun! Looks amazing! I’ve always wanted to hike the West Highland Way and keep putting it off. This just inspired me to move it up on the list! 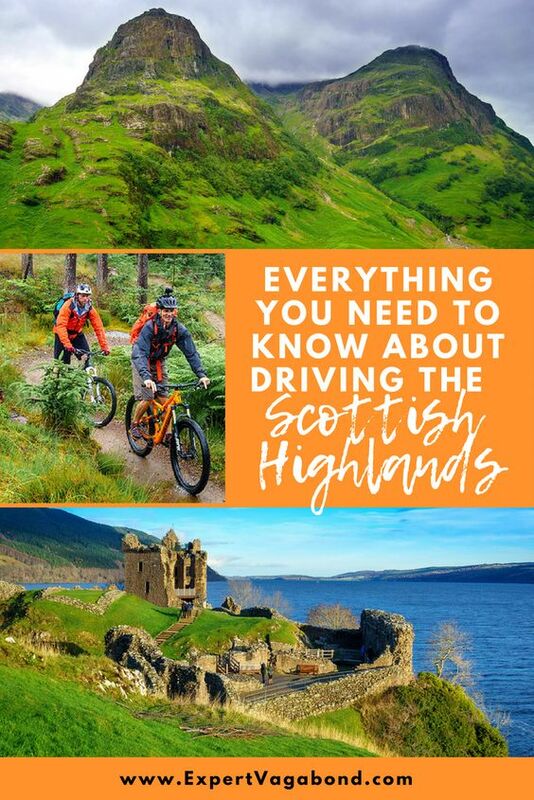 Wow your photos are amazing, we went round the highlands last year with EasyWays and they were amazing, your pictures reminded me of some great times – far better quality than the ones I took at the time! oh mannnnnnnnn! Scotland is beautiful!!!! I just read another scotland post (from another blogger) now im a little addicted and stumbled upon your post! Im sure the pictures dont do is justice but DAMN its green and beautiful! I so want to go!!! All the awesome places to travel to are on the othersie of the world!!! I think i need to stop eating for a few months to save up enough to come over for a few months haha! Funny Brexit is already affecting the exchange rates. I’ll like to visit the Old Pines Hotel And Restaurant with my young family. Looking forward to the adventure next month. Thanks for sharing, Matthew. This looks like an epic trip and loving the photos! My husband used to travel often to Scotland and is a big fan. One of my regrets of living in Europe for 6 years is not going to Scotland. Hopefully I’ll get there soon! I love the Scottish Highlands! I went on a cruise there in 2014, and saw many of these places mentioned on the article. I also saw the Orkney and Shetland islands. Great photos! I traveled around Scotland on my honeymoon and this took me right back! We took the other way around though; Glasgow – Edinburgh – St. Andrews – Inverness – Skye – Glen Coe – Glasgow. Was catching up on some back episodes of the Amateur Traveler podcast and heard your Greenland episode. Great stuff! Hey Stephanie! Glad you enjoyed the Greenland podcast. Love this post! I lived in Edinburgh earlier this year and did a roadtrip from the capital to Isle of Skye via Glencoe and this post made me wanna do it all again… Your photos are just amazing. Sweet! Yeah it’s a wonderful little road trip, driving through the Highlands on the way to Skye. LOVE the photographs! I lived in Scotland for a year last year as an American student, and I have been to all the areas you listed. 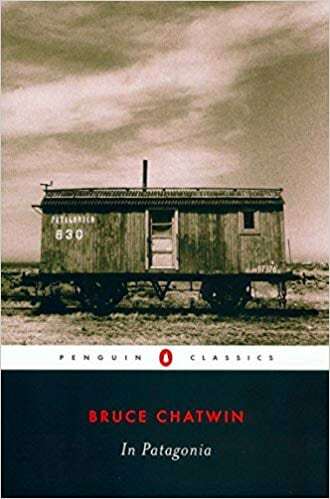 For the rest of the readers, if you’re into hiking, also do all or part of the West Highland Way! Scotland is an amazing and beautiful country, and although wet, is well worth the visit. I kept running into hikers on the West Highland Way during this trip, and wish I had more time to join them. Another time! 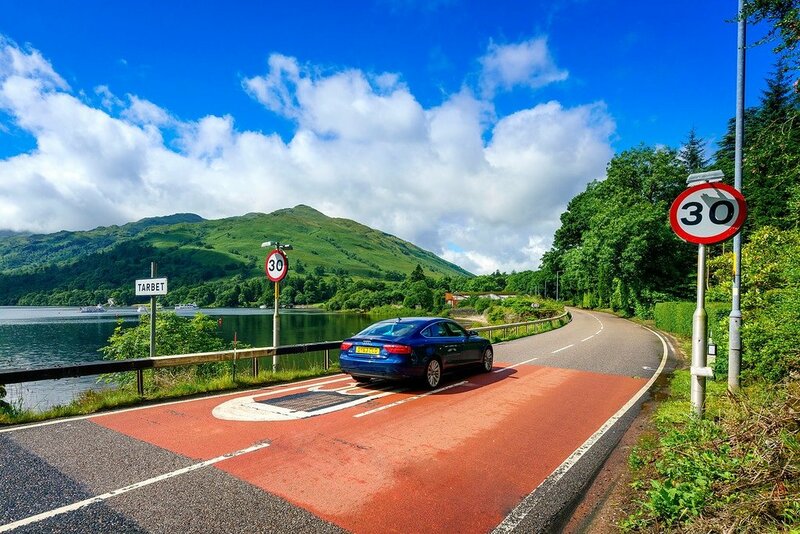 Home » Europe » Scotland » Driving The Scottish Highlands: Mountains, Lochs, and Glens!